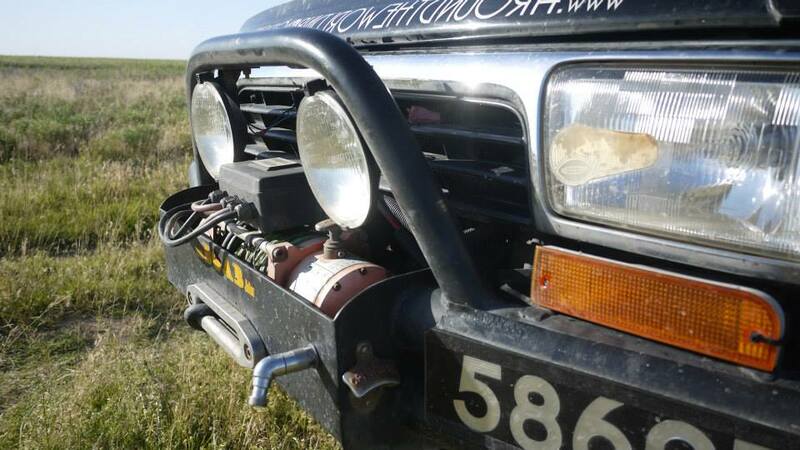 Bee-bee is a 1994 Toyota Hilux Surf SSRX 3.0 Ltd – she has a 3L Turbo Diesel 1KZ-TE engine and an automatic transmission. She was purchased off Ebay with little modification, had an impeccable service record and had never been taken off road. Why did you choose that vehicle? It was cheap to buy, cheap to run and cheap to repair. It had four-wheel drive and can be taken off-road. It is reliable and easy to fix. Spare parts are available worldwide. It fits inside a shipping container. It’s old enough that it has a basic mechanical engine and limited electronics. It’s big enough to carry us, our equipment and be self sufficient – but not too big to be a problem! Where does the name Bee-bee come from? What modifications have you made? Bee-bee has a 4” suspension lift with Old Man Emu Nitrocharger Shocks, the rear end has uprated Landcruiser 80 springs seated in custom adapters. The springs are fitted with assister blocks to help deal with all the extra weight. 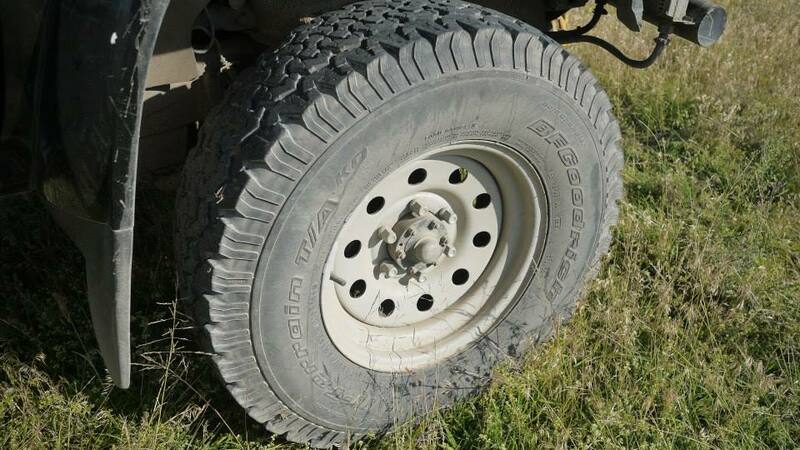 The vehicle sits on 265/75 R16 BF Goodrich A/T's. These tyres have been fantastic and are equally at home on the road as well as off. The tyres are available globally which is important when you need to replace just one! We installed a winch bumper made by Monster Truck Man (MTM) for added protection and to facilitate a winch. We explore fairly remote areas, often on our own, the winch offers a little security in those situations and has been used fairly regularly. We switched out the heavy steel cable for a synthetic rope that is much lighter. The spotlights were purchased from Ebay as Wipacs, I suspect they aren’t. They are not very good, we try not to drive at night so haven't replaced them yet. To help keep dust and water out the engine we fitted a Safari Snorkel with a cyclonic filter, we also fitted extended diff-breathers to the same height to avert the ingress of water into the differentials and gearbox. ​With the introduction of all this extra weight we frequently encounter problems with things overheating. Going up big hills in +40°C temperatures with all that extra weight the gearbox is under a great deal of strain. 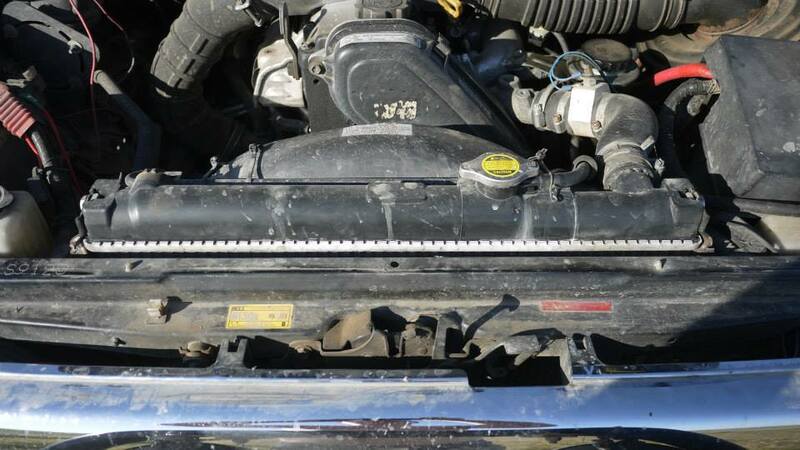 One of the major design flaws in the radiator on the automatic models is that the automatic transmission fluid cooler is based in the lower part of the radiator. The hot oil from the gearbox is then pumped through the bottom half of the rad. Instead of cooling, this can act like a heat exchanger and warm up what should be cool fluid in the radiator before pumping it back into the engine. Literally not cool! The cooling system is and has been a ‘work in progress’ – It’s had, and continues to have various incarnations… currently we have a Mocal ATF cooler to help keep the temperature down on the gearbox. We swapped out the standard radiator and fitted a much larger one. The temperature now rarely goes above 92°C unfortunately this radiator is due for replacement soon as it is starting to leak. To help draw airflow through the radiator and to reduce engine bay temperatures we installed a Kenlowe extractor fan in the bonnet. The car is black and on sunny days the bonnet is 'egg-fryingly' hot. The fan reduces the engine bay temperature by about 10°C and helps draw airflow through the radiator. This is great in slow moving traffic. Whilst messing about with the cooling system we fitted a Bushranger heat exchange hot water shower system. The water is pumped from a water tank mounted in the rear of the vehicle, through the heat exchanger. The temperature of the shower is controlled by the vehicles interior heater controls. 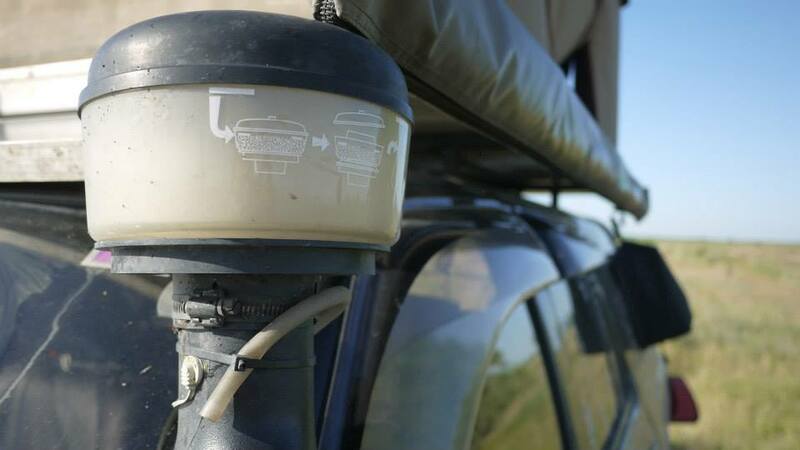 The outlet is mounted on the front bumper so that the shower can be used in conjunction with our pop-up cabin tent. The auxiliary electrical system powers our Waeco fridge, Viair tyre compressor, various LED lights and is often used to charge cameras and phones. The vehicle has an Odyssey PC1500 deep cycle house battery. The battery can handle a slow discharge to flat and recharge as well as high cranking amps; this means in emergencies we can actually use it to start the car. We currently don't have a power inverter but we do have a mains extension lead that we can plug in at campsites. We purchased the solar panel and regulator in Morocco, on a sunny day it dishes out enough power to keep the house battery charged whilst running the fridge and charging laptops and cameras. The solar regulator helps keep a watchful eye on the house battery voltage. 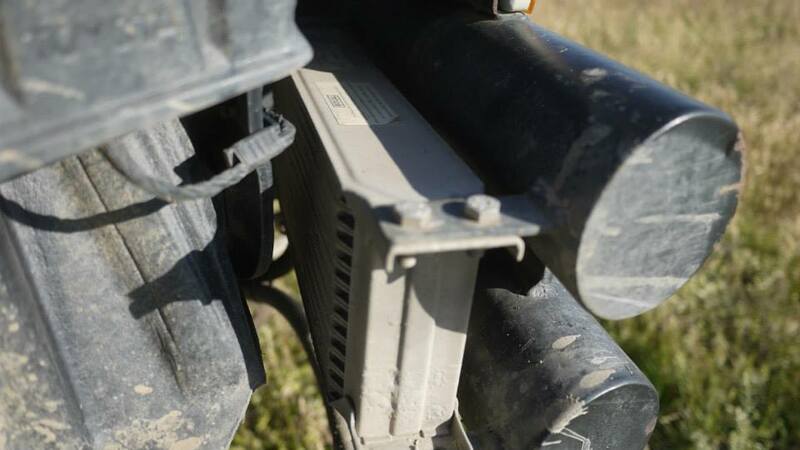 We used to have an expensive split charge battery system. It worked amazingly for about a year and then died, leaving us stranded with 3 flat batteries and ruining the alternator in the process. We now have a manually operated battery switch that links the house battery into the starter circuit, great for extra power when winching. When attached the house battery charges from the alternator circuit, handy when it's cloudy. Inside the vehicle we tried our best to make use of every available space. We installed a roof cargo net, torch mounts and removed all the interior plastics in the rear cargo area. This opened up the spaces above the wheel arches, great for storing little used, but essential items. 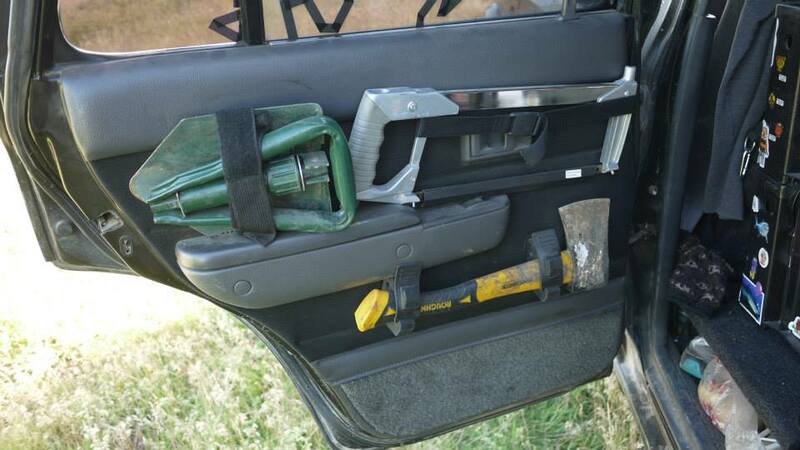 We utilised the inside of the rear doors for storing items too. What ‘creature comforts’ do you have? Our most extravagant purchase was our Maggiolina Airtop roof tent. Quick to set-up and pack away which is what you want if you are sleeping in it everyday. It offers a little luxury and is one of the most convenient rooftop tents on the market. From the roof-bars we attached a Terrain side awning for protection from the sun and rain. The awning has additional tent sides that add a little protection and an extra room for when the weather turns bad. Our other luxury item is our Waeco Fridge. On an extended trip like ours it's essential to have cold beers! What problems have you encountered with the vehicle? All the extra weight that the vehicle is carrying can be problematic not only with the cooling system but also to the braking system. 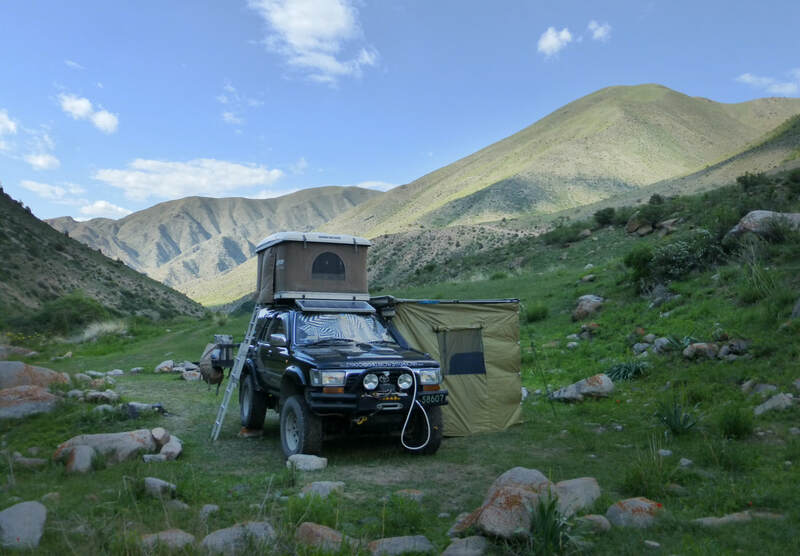 On long descents the brakes have been known to overheat trying to stop all the extra weight; a problem we are yet to solve, my initial thoughts are to simply carry less “stuff” – unfortunately the heaviest items are things we can’t live without (water tank, tent, winch bumper). We have also encountered a few problems with the suspension, transmission and axles due to the changed geometry from the suspension lift. Again resolving these issues is a work in progress. The vehicle is currently black and doesn’t have any air conditioning – when in hot countries the interior temperatures can be fairly unbearable. We normally just open the windows and everything is fine!